Prince Jung wakes up from his piano bed to find his minions working out or talking about something. He asks if there’s anything interesting to do. Minah and Brunette (is she Lee Hae In?) come in which promts Soo Hyuk to shut the piano case on Prince Jung. They ask the minions what they are doing and if they want to go watch a movie together at the movie theatre. Prince Jung says something and Soo Hyuk coughs to cover it up, but the girls wonder if they heard Prince Jung’s voice. Hyun Joong pushes them out the door and Soo Hyuk asks if Prince Jung is okay. Prince Jung’s okay but he laughs like a maniac however, what’s a movie theatre? 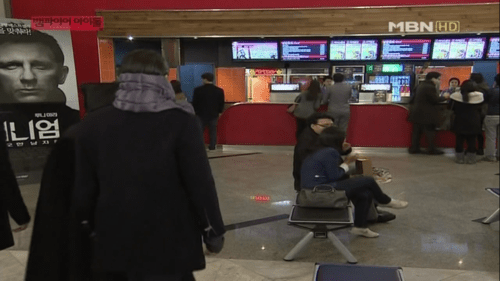 Jong Hyun types it into his tablet and reports that it’s where people go to watch the latest movie; it’s also the place that friends go to as well as where dates are usually held. Prince Jung get’s excited, does this mean they want a date with him?! Prince Jung tells them all to get ready except for Soo Hyuk because he’s still not stable around human beings. Soo Hyuk complies. They walk to the theatre where the girls are dressed up in disguises. Woo Hee doesn’t like him being here but poor Prince Jung doesn’t know that. Jong Hyun whispers to him to do something so he winks at Woo Hee which causes her to be shocked. Prince Jung and Jong Hyun turn away shyly. Woo Hee thinks he’s crazy and hides in shame. They think she must be shy and they’re all happy. The elevator opens and the girls go in without waiting for them so the elevator door closes before them. They look around at the movie theatre and they see the concession stands so they walk over there. The worker greets them and asks how she could help them. She thinks that he wants the combo set and asks what he would like. He says something delicious so the worker gives them popcorn and a drink. 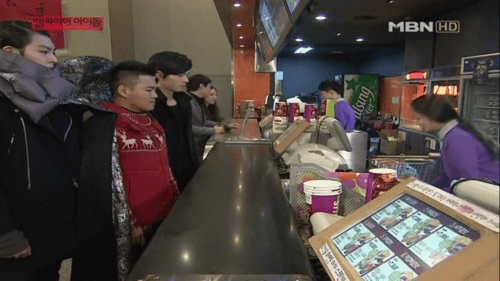 It comes out to be 7500 won or $7.50, but they don’t have money so Prince Jung asks if they could just have it for free; the worker just takes the food away. They find where the girls are at and try to go over there, however, they are stopped by a ticket stand worker who asks for their ticket. Prince Jung says they don’t have one (lol). They end up at the ticket booth where the woman tells them the prices of their tickets which get Prince Jung annoyed. They have to use money again?! Prince Jung says they don’t have money and to just let them go in (haha). Meanwhile, inside the theatre, the girls are waiting and looking around for the vampires. Minah wonders why they haven’t walked in yet and Brunette asks if she should call them, but she realizes she doesn’t have their phone numbers. Woo Hee tells them to keep it down or people might see them. Right at that moment, over the intercom, a woman says a prince is trying to look for Girls Girls (hahaha). Everyone in the theatre looks around and the girls quickly sneak away. 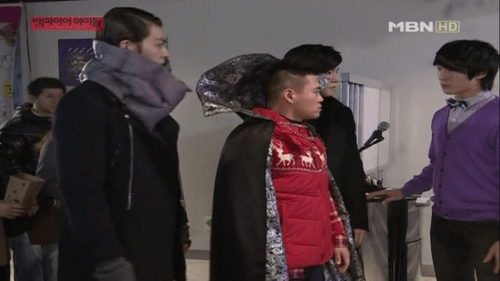 A theatre worker is blocking them from entering the room and Prince Jung tells them to move so he can find them. The worker says he can’t allow them to do that. Jong Hyun tells them that they have no money (haha). The theatre worker says then they can’t come in. Prince Jung spies the girls and shouts “Woo Hee! I’m right here!” Woo Hee tells the girls to quickly run and they shove aside the vampires while calling them idiots. At home, Woo Hee yells at them for doing that. Woo Hee says what kind of prince is he and that if he ever bothers her again, he’s dead. Poor Prince Jung. Brunette wonders why they don’t have money even though they have a contract. Sumi is help Manager Shin clip his toenails when she asks if there way any other woman he liked to which he replied that she’s his number one and he’s not the kind of guy to just pick anyone. The vampires walk in on this flirting which scares them. Prince Jung demands that Manager Shin give them their money, they heard from Girls Girls about it. Manager Shin says they don’t have any and Soo Hyuk threatens him. Manager Shin tells them how the money is at the bank (?). Jong Hyun looks it up and tells everyone. Prince Jung wants the money now but Manager Shin tells him that they need to wait three weeks. Prince Jung tells him to just get it now. Sumi tells them that it’s closed today and to go tomorrow morning. Manager Shin agrees and tells them to go to sleep now. The next morning, the vampires wake up early and meet Manager Shin who seems to be a rush to avoid them. Prince Jung asks if he got the money. Manager Shin was just going to go right now, but Soo Hyuk is suspicious. Manager Shin is hurt that they doubt him. After all that he’s done for them, they still don’t trust his words? 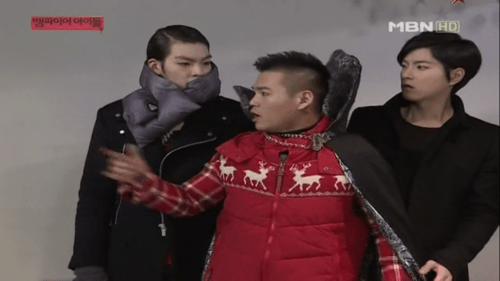 Prince Jung wavers and tells him to just get the money. The girls come back from the movie and are raving about it when the vampires walk in. Prince Jung asks where they went and Brunette tells them that they went to watch the movie they couldn’t see yesterday and that they should go watch it since it’s really good. Prince Jung asks what movie is that and Jong Hyun starts rambling about the facts of the movie which impresses the girls. Minah is surprised that he hasn’t seen t he previous ones, but then maybe since he was in Africa, he couldn’t. 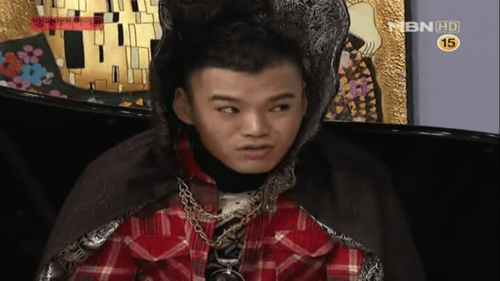 Woo Hee teases him about being a prince yet he’s poor. 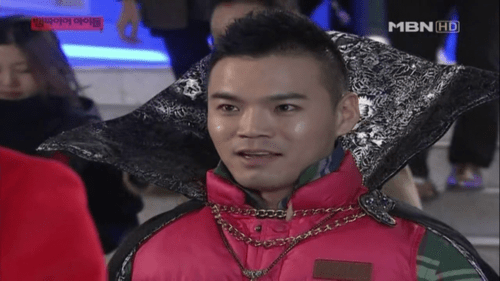 Prince Jung retorts that he does have money! Woo Hee tells him to treat them all out then; Prince Jung says in a small voice that he doesn’t have any at the moment which elicits laughter from Woo Hee. Prince Jung’s pride is hurt so he tells his minions that they have to go to the bank (?)! Meanwhile, the president is hiding in his office so he could access his safe which is behind this big framed picture of Girls Girls. Manager Shin walks in right after he’s placed the money in, however he probably knows what behind the picture since the picture moved plus the president is making it too obvious (haha). The president asks what he wants and Manager Shin asks if he’s busy. Since he is, Manager Shin decides to just leave. Manager Shin couldn’t believe that the president would hide all that money from him. They wonder what’s taking Manager Shin so long and when they hear the door bell ring, they all rush downstairs. It’s not Manager Shin though, but a dry cleaner delivery guy who’s handing Sumi the dry cleaning. Sumi hands over money from her wallet which the vampires all eye (haha). Kwang Hee and Woo Hee walk in and he teases Prince Jung about having no money. Soo Hyuk’s about to attack Kwang Hee but Prince Jung stops him. Kwang Hee continues his teasing and asks if he wants to have some of his money? Prince Jung looks tempted but Soo Hyuk steps in front of him and tells him not to do it. They sit down on the couch dejected until Prince Jung finds Sumi’s wallet in the couch. He wants to use it however Soo Hyuk is discouraging him from doing so. They all try to dissuade him, but he’s set on going to the movies and they’re about to get up and go when Sumi comes in. She’s trying to figure out where she placed her wallet and she asks them if they had seen it to which they all shake their heads. When she’s gone, the vampires set down the wallet and Prince Jung asks who wants to go with him to the movies however none of his minions raise their hands. 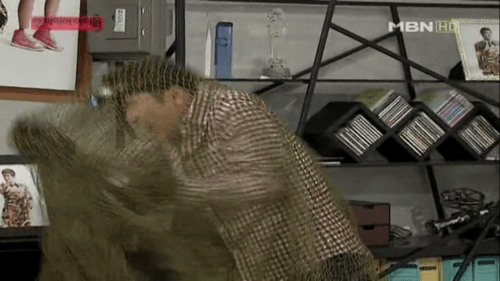 Prince Jung throws a tiny tantrum and Soo Hyuk decides to go. Hyun Joong wants to go because there’s something he wants to eat (?) and Jong Hyun says what would he do at home if everyone else is gone. Prince Jung tells Soo Hyuk to stay at home though since he’s still a danger to humans (aww). Meanwhile, Manager Shin is carefully calculating the times when the president is out of his office. Looks like he’s planning a theft. He will first take out the security camera located in front of his office then take out the one inside his office. 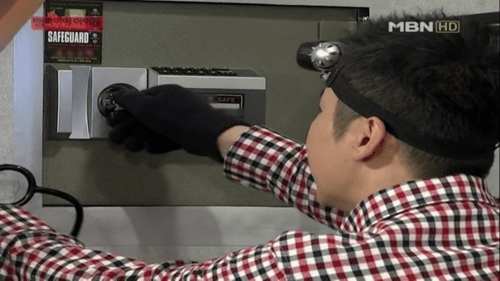 He’ll use a stethoscope to crack the safe. He’s able to open it but he didn’t calculate having a net on him into his equation and is caught by the president. 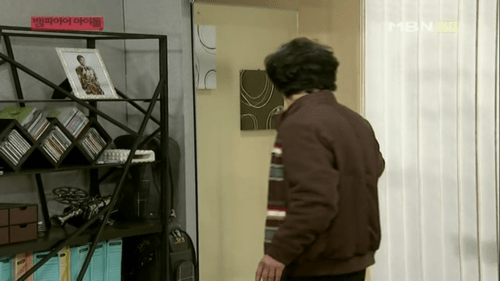 It turns out the president has a buzzer on the side of the shelf so when the door is opened too far, it will trigger the alarm clock which causes the net to open up and fall onto the robber. Manager Shin couldn’t believe he had that and the president asks why he’s stealing his money. Manager Shin twists it so that it’s the president’s fault that he’s hurt. He rubs his elbows and leave before the president could say anything. The vampires minus Soo Hyuk walk into the movie theatre and smile, they are finally here. The concession stand lady recognizes them and is slightly irked at them being there, but Prince Jung tells her not to worry as they finally have money. Cut to the scene where the worker is standing there counting all the coins while the people behind them are impatiently waiting. It turns out they can only afford one ticket which gets Prince Jung disappointed since he wanted the two of them with him. 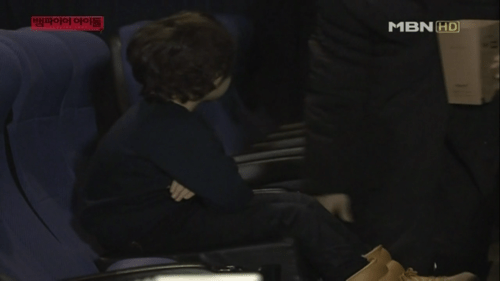 He asks where Hyun Joong went and he went to get him some popcorn (aww). I think he said he got it from the trash can or took it from somewhere, for sure he didn’t buy it (haha). He walks into the movie theatre where he sees a little kid sitting on two cushions to give him a boost so he sits on them too (LOL). 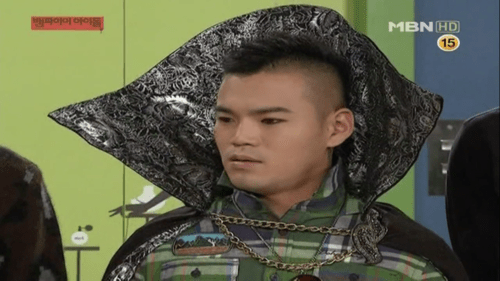 His cape also blocks the viewers behind him, but he doesn’t really care. He’s laughing at the movie and trying to grab things since it’s his first time at a 3D movie. He also dodges and shouts out things like it’s actually coming towards him (hehe). He takes a soda from the people sitting near him which prompts them to move away. 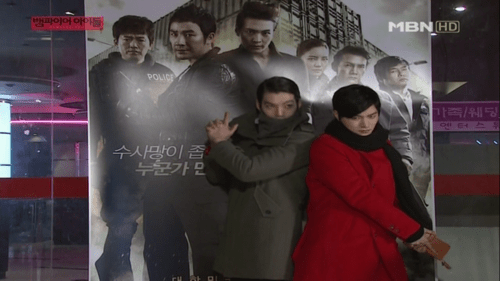 The movie ends and Prince Jung walks outside to see his two minions posing in front of a movie poster for Special Investigation Bureau that stares Uhm Tae Woong and Joo Won. They ask Prince Jung how the movie was and he said it was very spectacular. Next time, they have to go together and the two minions agree. They go home and Soo Hyuk reports that Sumi might have found out. They all gasp and Sumi walks in, asking where they went. 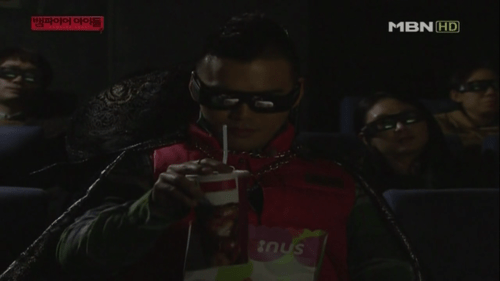 Prince Jung says they went to the movies which causes Sumi to ask with what money. Soo Hyuk pretends to be distracted by his surroundings while Prince Jung tries to fish for some answer. Eventually, the wallet falls out and Sumi is shocked that he would steal it and calls him a thief prince. I was a bit confused at this scene but I think she tells them not to talk about money from the contract anymore since they owe her one for using her money. If they keep talking about it, she’ll just have to tell the police what happened (?). Their punishment includes peeling garlic. I don’t know what the news report talks about or what Prince Jung says. 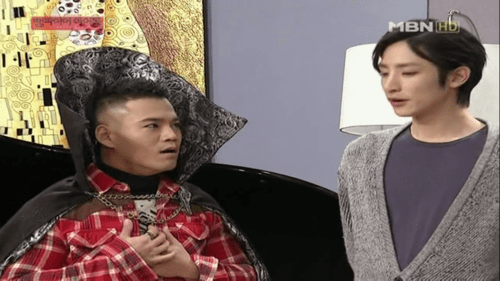 Manager Shin comes home and worries about how to get the money to Prince Jung, but Sumi tells him that he doesn’t even talk about the money anymore. Manager Shin finds it strange and wonders what happened. Sumi tells him that she’s so tired and leans on him while thinking about her ingenius plan she had executed. She placed the wallet there on purpose as bait and watched as Prince Jung succumbed to stealing it. 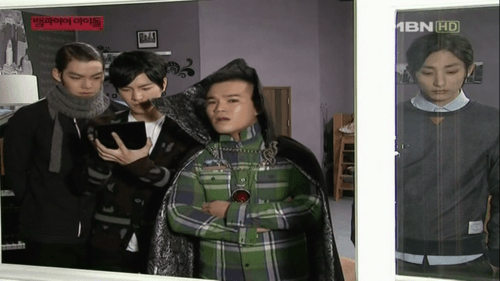 This episode toyed with Prince Jung’s sense of right and wrong and unlike all the other prince’s, he chose to the do wrong LOL. But boy did it allow hilarious scenes to happen. 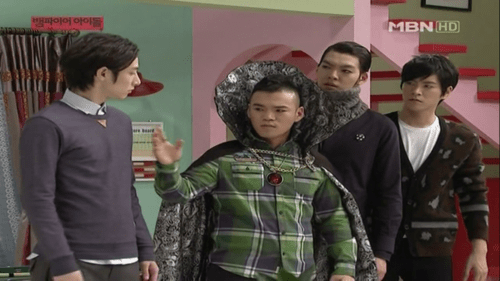 I was sad that the vampires will be losing out on the money just for spending a few of Sumi’s cash, but then again it could be a good thing for Manager Shin since he probably used that money to pay off the debts. But it seems like the vampires are getting the short end of the stick. There wasn’t much of Soo Hyuk today or Min Kyung or both in the same screen or Prinec Jung and Min Kyung scenes argh, i don’t know who to ship! But anyways boo. Just ’cause I love this pic.